With this post I come to the end of three terrific years as Head of School for St. Gregory College Preparatory School in Tucson, Arizona. It has been an honor to serve, and I know I will treasure always these years as an extraordinarily high point in my educational leadership career. In our three years together, we’ve seen enrollment stabilize and grow (after ten years of nearly continuous decline), and expanded external financial support to the annual financial aid/scholarship funding by several hundreds of thousand dollars– allowing us to considerably diversify enrollment and provide new opportunities to students who otherwise wouldn’t have this chance. Each of the three years has ended financially with a good, positive balance sheet. 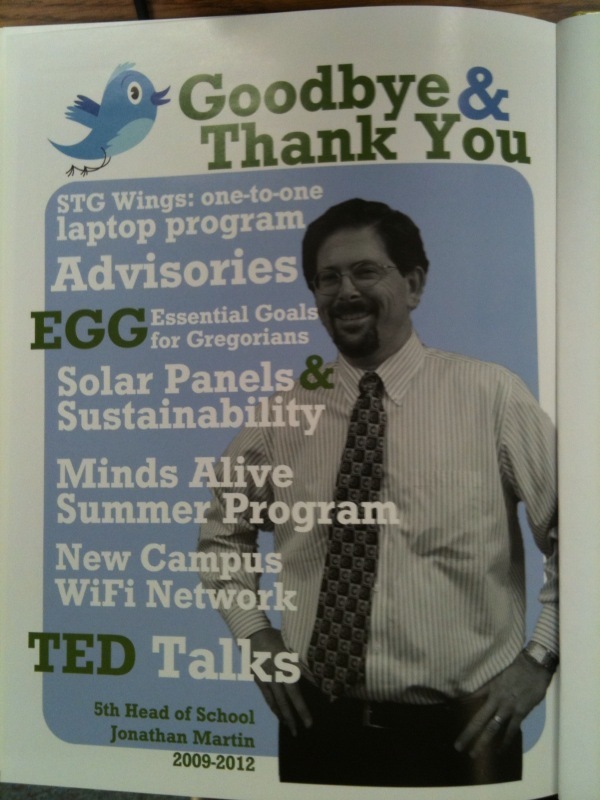 From the St. Gregory 2012 yearbook. I am most pleased about the ambitious twin initiatives, “Roots and Wings:” Advisory and Laptops, which we launched in 2010. First, we dramatically overhauled what was previously a small homeroom program into our new, teacher-student advisory program, strengthening student “rooted-ness” with a home base over the course of each week and strengthened relationship with a teacher and other students. Advisory has also become a new home for service learning, teacher mentoring of students, parent-student-adviser conferencing, and much more. We’ve also, especially in the middle school, developed several new bullying prevention programs, which brought a national award from Teaching Tolerance, and significantly revamped our bullying and harassment policy for the entire school. We launched a trio of new student outcome measurements, CWRA, HSSSE, and MAP, and I believe we are the only one of the 1400 NAIS member schools to be using and learning from all three of these fine new tools. We use them because we are more serious than ever about academic outcomes, and want to use the best tools we can to track, monitor, and intervene to improve our educational program. Believing that we must assess what matters to us, new report card extension, providing goal-setting and formative feedback for our students on a set of 21st century and mission-central skills we call the EGG: the Essential Goals for Gregorians. We’ve also worked in both the middle school and upper school to increase and enlarge academic requirements: now 8th graders must take 8, rather than 7, classes, and our graduation requirements for high school students include four years of math and history (up from three), and have gone from 24 to 26 credits in total. Our faculty culture of collaboration and planning has been greatly improved by the addition of two hours weekly (previously it was one monthly) for time dedicated to this, and the valuable work of our new Critical Friends groups. I should add that an important priority of my leadership, and a critical recommendation to us from our accrediting association, was that we progress in diversifying racial/ethnically our faculty and administration, and we’ve done that significantly, taking the percentage of professionals of color in three years from under 3% to about 15%. In these three years we’ve also doubled the number of Ph.D’s on our faculty, from 3 to 6, with the appointment of three new Ph.D’s to our upper school. Knowing that a high performing and always-growing faculty is of the highest priority, we worked as joint admin-faculty team to completely revamp our teacher evaluation system, taking it from every four years to annual, and building into it a stronger goal-setting and growth orientation. I also implemented in 2011 St. Gregory’s first ever annual written evaluation for senior administrators. A major theme for educational program development has been developing innovative mindsets and habits for our students, and we’ve developed several new elective courses, new project-based learning units, new experiential education elements, and a new special diploma program, to advance this important theme. Dennis Connor in particularly has built his physics lab into a robotics and engineering lab, and it is a very exciting place, complete with a 3D printer. (Some of our initiatives on this front are featured in a forthcoming book (July, 2012) by Suzie Boss, Bringing Innovation to School). We’ve installed more than 600 solar panels on the roofs of 5 of our buildings, providing more than 30% of our energy usage, and re-engineered air conditioning for our gymnasium, dramatically reducing our carbon footprint. We’ve built out a new community garden on campus, and a new goat and chicken pen in the middle school. Through a variety of initiatives, including the new Youth Leadership Summit for 7th graders from 20+ schools, the continuation of the Rotary Car show, hosting a new 5K/10K charity run, new speaker and film events, and other activities, we’ve made good progress in better sharing our campus resources with the wider Tucson community. Summer at St. Gregory has also been transformed; we brought back to campus the elementary day-camp Summer Fine Arts, which had left us in 2008, and we launched a brand new, now thriving, academic enrichment summer day-camp for middle school students called Minds Alive: Leadership and Innovation camp. Looking forward, I’m anticipating a very different and very exciting several years learning, writing, sharing, speaking, and consulting on the topic and cause I am most passionate about: advancing 21st century learning and schools of the future. I’ll be blogging regularly, and I have several other writing projects in the works. I’ll be keynoting and speaking at educational conferences and for faculties, boards and parents at schools around the country and beyond; I’ve already confirmed about eight such “gigs” for the coming year and new invitations and opportunities are arriving each week. To expand the breadth of the work I do supporting schools, districts and associations, I’m developing and promoting my new educational consulting practice, JonathanEMartin Ed. Services. At the same time, I’m forming affiliations, formal and informal, with a wide variety of national educational organizations and consulting firms, including Educational Collaborators, for whom I’ll do some consulting on strategic planning, technology integration, and professional development. As a family, we are staying here in Tucson, most of all because both my sons are happily enrolled in schools which suit them well, including my older son, who will be entering the 9th grade right here at St. Gregory, which my wife and I believe is a perfect match for him. My wife, Carman Ryken, has accepted a terrific appointment as a math teacher at an exciting, dynamic, progressive charter school here in Tucson, Paolo Freire Freedom School, a middle school of about 75 students. The school is a great match for her educational philosophy and ideals and also for my own views: the school uses a very interesting and exciting problem-based learning math curriculum called “Connected Math,” out of Michigan State University. I’ll surely blog about the qualities of this math curriculum in the months to come. With my wife employed full-time, I’ll be, happily, picking up a larger share of the household management and parenting. As a family, we’ll also continue hosting in our home international students enrolled at St. Gregory, something we enjoy greatly. Over the course of what potentially will be 25-30 more years of professional work are many possible career paths and projects, I anticipate: among them are returning, almost certainly at some point, to independent school leadership positions; joining a national educational reform organization on a full-time basis; and taking on state/regional or national association management roles for independent schools or other school groups. To my St. Gregory colleagues, parents, students, and supporters, thank you very, very much for inviting me to join this community and serve this school’s excellent and extraordinary mission. To my readers, please know that the blog carries on and the best is yet to come. Onwards. Great work Jonathan. Would love to catch up one of these days you are visiting the Bay Area. Ray (look me up at Park Day School). Pretty amazing accomplishments here! Best of luck to you in your new endeavors. Well done. Best of luck as you begin the next chapter of your life and career!